Kasper Holten’s new production of Mozart’s Don Giovanni, starring Mariusz Kwiecień, Alex Esposito and Malin Byström, was screened live across the world on 12 February as part of our Live Cinema Season 2013/14. The relay, which was presented by Bryn Terfel, included backstage films featuring rehearsal footage and interviews with the cast and creative team. In case you missed them, or just want to find out more about the production, here they are again. 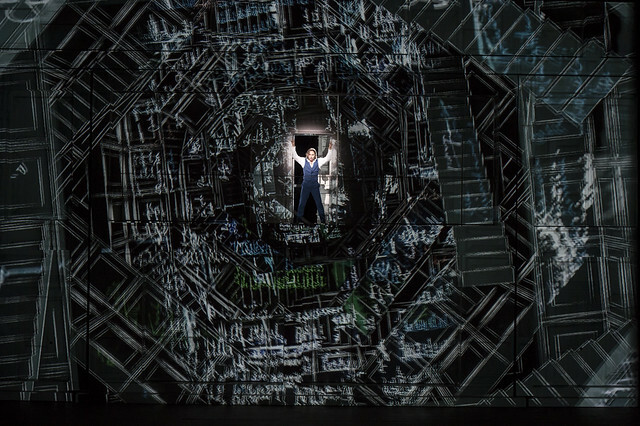 Kasper Holten, conductor Nicola Luisotti and set designer Es Devlin discuss Mozart’s classic tragicomedy and the challenges in staging it, while members of the cast introduce their character in the opera. Kasper Holten, Nicola Luisotti and singers Malin Byström, Véronique Gens and Elizabeth Watts introduce the three main female characters in Don Giovanni - Donna Anna, Donna Elvira, Zerlina - as well as the different music that portrays their emotions. The Royal Opera House Cinema Season relays our performances to over 1,100 cinemas in 29 countries around the world. The next live relay will be The Royal Ballet’s The Sleeping Beauty on 19 March. Other productions in the 2013/14 Cinema Season include The Winter’s Tale and Manon Lescaut. Fantastic and to be able to be part of the experience in the comfort of our cinema in The Heart of Hawick in the Scottish Borders was a triumph for technology. We are even getting used to clapping at the screen although it might take a few more interval drinks to be brave enough to give it the standing ovation it deserves.Thanks to all. Just seen Don Giovanni at Cineworld in Ashton-under-Lyne. A wonderful night with better than front row seats. Loved the music, the set and the brilliant cast. Thank you ROH! Just wachted CinamaLive at Sapporo Japan,and... What an idea! Ink written dresses,amazing set design and concept,singers are so good and Mozart's music is always beautiful.Thank you for ROH's great creation. Very moved. Watched in Hebden Bridge. Heart warming and memorable production, stunning performances. Outside, the weather was terrible but went home feeling joyous. Seen at Okehampton live stream. Fabulous production. In particular the performance from Antonio Poli was sublime, heartfelt and so moving. I thought that the portrayal of the Don as a lover and not a murderer was wonderful. He had me at the 1st! I watched this Don Giovanni at the ROH, twice, because it was the most beautiful, imaginative, challenging production of Don Giovanni I have ever seen. To see Donna Anna, not as the traditional victim, but more a willing participant in the the Dons games. For Zerlina to be less the simple country girl as tradition often dictates and instead be more socially ambitious and therefore more than happy to appease the Don. The dynamics between the characters were so different from previous Dons I have seen and it brought a freshness and a totally different perspective for which the audience to experience this Don. It really was one of the most beautiful things I have seen. The most amazing casting coupled with the incredible set and video mapping technology. I hope for a revival. Bravo!! ensemble of voices we have ever heard, and most of them unknown to us. We hope to attend live in the future. I wonder who is the photographer and designer who made the poster of Don Giovanni ??? They were created in collaboration with the agency AKA.